Make the Exact Color caulk you need! Are you tired of ugly caulk lines? Have you been on an endless search for that perfect caulk, custom colored to match your new paint job, only to end up lost and disappointed? Your search is over. 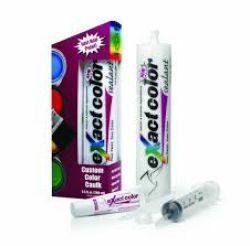 Perfectly color-matched caulk is here witheXact color®. Just add your paint, mix it up, andvoila – you have aneXact match to any color. No tools required. No mess. Best of all,eXact color has all the same performance properties of Big Stretch®, so you don’t have to worry about whether or not it will actually work. Rest easy, stop searching, and use eXact color.